The death sentence against Fayadh is the latest example of the Kingdom of Saudia Arabia’s lack of tolerance for freedom of expression and ongoing persecution of free thinkers. 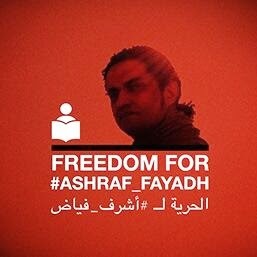 We, Fayadh’s fellow poets and writers, urge the Saudi authorities to desist from punishing individuals for the peaceful exercise of their right to freedom of expression and call for his immediate and unconditional release. As a member of the UN Human Rights Council (HRC), the pre-eminent intergovernmental body tasked with protecting and promoting human rights, and the newly elected Chair of the HRC’s Consultative Group, Saudi Arabia purports to uphold and respect the highest standards of human rights. However the decision of the court is a clear violation of the internationally recognised rights to freedom of conscience and expression. Article 18 of the Universal Declaration of Human Rights (UDHR) states that, ‘[e]veryone has the right to freedom of thought, conscience and religion; this right includes freedom to change his religion or belief’. Furthermore, under Article 19 of the Universal Declaration of Human Rights, ‘[e]veryone has the right to freedom of opinion and expression; this right includes freedom to hold opinions without interference and to seek, receive and impart information and ideas through any media and regardless of frontiers’. Saudi Arabia is therefore in absolute contravention of the rights that as a member of the UN HRC it has committed to protect. PEN International er chokeret over dommen over den palæstinensiske digter Asraf Fayadh, der den 17. november blev dømt til døden i Abda, Saudi-Arabien. Dommen lyder på apostasi (frafald fra islam) og indeholder foruden dødsdommen også en dom på 800 piskeslag. Asraf Fayadh har i følge PENs oplysninger hverken udøvet eller opfordret til vold, men udelukkende gjort brug af sin ret til ytrings- og trosfrihed.